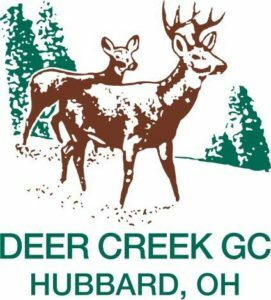 Deer Creek Golf Course is a privately owned public 18 holes golf course located in Hubbard, Ohio. Jim and Phyllis LaCivita bought the course in 1981 as a 9 hole course. By 1987 a second nine holes were designed and constructed by Jim LaCivita to make Deer Creek a scenic 18 hole course. The layout consists of a picturesque view of rolling hills, straight and dogleg terrain. Our fairways are well manicured with a double rowed watering system. The greens are a lush bent grass and some are accented by sand traps. We have beautifully landscaped tee boxes and several lakes throughout the course, making it challenging along with enhancing its beauty.